CamJam by Nite Ize | Fishing Reviews | FISHING FURY - A Fishing Blog with Attitude! Nite Ize may be more well-known for their flashlight and LED accessories, but they also produce a variety of innovative outdoor gear that’s sure to fill the void in any adventurer’s kit. 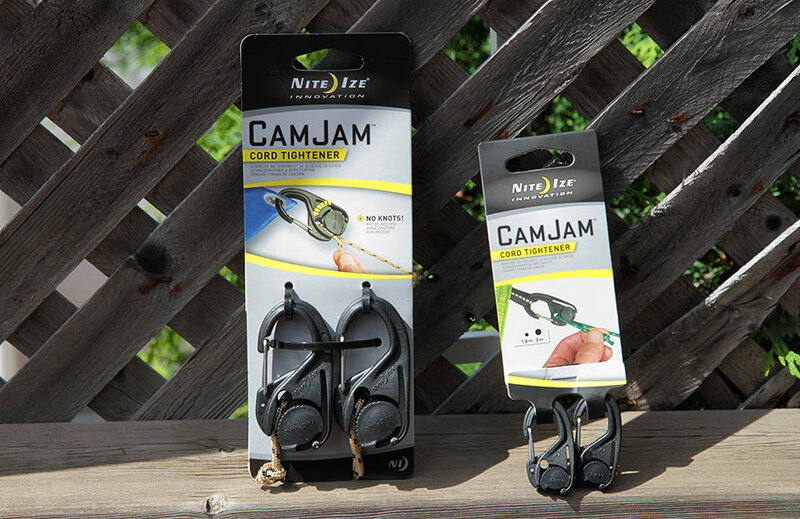 One such product is the CamJam, a custom carabiner that locks securely in place and can be tightened by pulling the cord rigged through the back and held in place by a spring-loaded cam. Having been stuck in my fair share of rainstorms while camping I can tell you that getting a tarp up when you need it most is not always an easy task. The CamJams they looked like an ideal solution and with an upcoming trip to Algonquin Park with rain in the forecast I knew it would provide the perfect opportunity to test them. With four CamJams I was able to deploy and rig a tarp in only a few minutes by myself. It’s dead simple! Just tie your cord to four trees, attach your CamJams and then clip the four corners of your tarp and tighten each corner by pulling the cord through the spring-loaded cam. That’s it, a perfect tarp deployment everytime! I also tied an overhand knot on each cord so that if it slipped from the cam it wouldn’t drop the tarp. This wasn’t a problem for the larger CamJams, but the smaller ones did slip under some heavy winds. CamJams are simple, reusable, tie downs that tighten in seconds with a simple tug on the cord.